You can import gpx files into Looking4Cache. Of course the simplest way is to import them over the Geocaching Live API. You can also import gpx files from other sources (like GSAK, iCaching, GCTour, dfx.at, munzeeclub.de). In the pro version you can also import gpx files (and zip files containing multiple gpx files) out of iOS Mail, Safari or for example Dropbox. Just use the ‘Open in’ function. It is possible to import a gpx file directly or import more than one gpx files in an zip archive. If the waypoints included in a separate gpx files (like by geocaching.com the 2nd file ending on ‘-wpts.gpx’), use a zip archive. Drag the file from the Finder / Explorer in the list of files. The tansfer starts immediately. 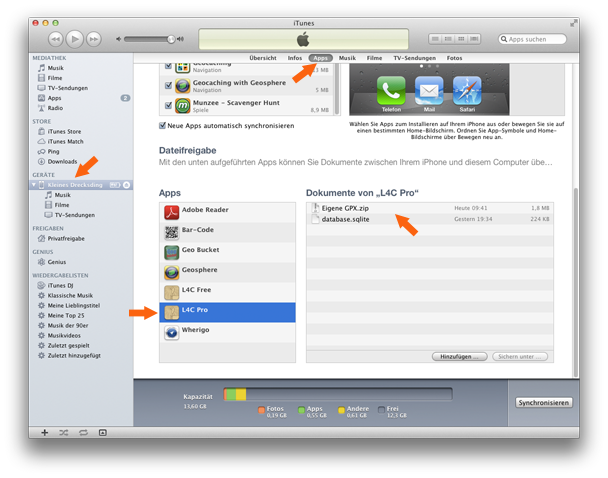 Note: With iTunes you can also delete files. Don´t delete the ‘database.sqlite’. Open the dialog to manage cache lists and select the option ‘Load Pocket Query / load from file’. Select a existing category as target or create a new category with the plus-icon. Consider the options on the end of the list, like ‘Delete file after import’. The list with gpx and zip files appears. After you select a file the caches will be imported. I changed the import for gpx files created in GSAK in version 1.1. It is possible to import GSAK gpx version 1.0 and 1.1. It is also possible to import files including caches and waypoint in one gpx file. It´s not mandatory to separate caches and waypoints in different files. The maximum count of caches per gpx file is limited by the memory of the iOS. Close all other apps in the background to get more free memory if you import a large file. Logs need a lot of space while importing. Maybe it is good to partition into different gpx files if you import several thousand caches.